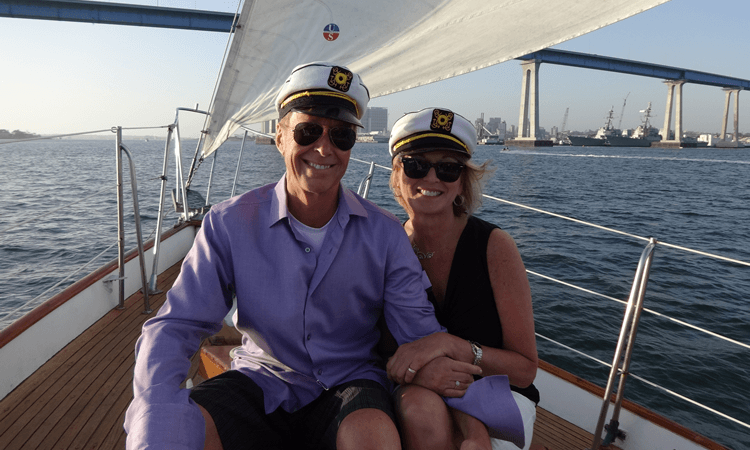 San Diego Private Sailing Charter for romantic cruises, wedding, anniversaries, birthdays, graduations, bachelor, and bachelorette. Private group charters are for all festive occasions or celebrations including wedding cruises, anniversaries, birthdays, graduations, bachelor – bachelorette and retirement, San Diego private dinner cruises and many others. Pirate theme parties are a favorite for kids of all ages! Arrrrgh! Private and Corporate charters begin at $1,200 for a group of eight people. This includes Captain, crew, beverages and light snacks. *Times and prices are subject to change. *Motor and sailing yachts of various sizes available. *Special catering requests easily accommodated. Sail Jada Charters is honored to have welcomed numerous San Diego sailboat passengers on its beautiful boats. From private charters to public charters, Sail Jada provides memorial at sea cruises, whale watching and sunset cruises in San Diego. Call (858) 222-9479 to learn more today. Click here for a San Diego private charter quote.